Last week during a lull in the home improvement activity, mom & I took a trip to Robinson Mall. Around 1 pm, we realized we were really hungry, but we weren't ready to leave the mall, so we debated between a food court place and Houlihan's. Houlihan's won. 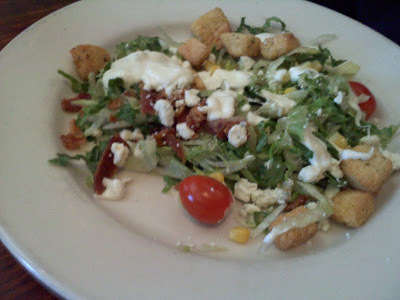 I've blogged about them before since SP and I sometimes grab a quick dinner there. But this was lunch, and we discovered that they have a 15 minute guarantee at lunch. After you place your order, your food is guaranteed to be served in 15 minutes (or less) or else it's free. The hostess even puts a timer on the table for your server to set after you order! We each chose a lunch entree combo - an entree with soup or salad. 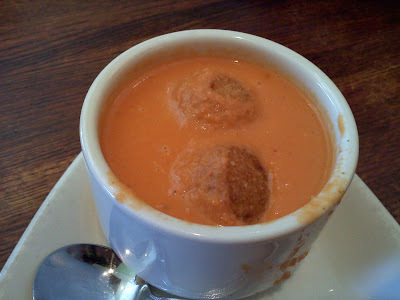 I chose the soup, specifically the soup du jour, Creamy Tomato Soup: This is what made me want to blog about Houlihan's again. Of course I didn't have my 'real' camera, so these photos are cell phone photos. See those 2 huge blobs floating in the soup? I assumed they were gigantic croutons. But they weren't. They were fried cheese balls. Sooo tasty in the soup! I chopped each fried cheese ball into pieces and ate a tiny bit of ooey gooey cheese with each spoonful of soup. Since I love fried cheese and this was an unexpected delight, it kind of made my day and got me energized and ready for more shopping! 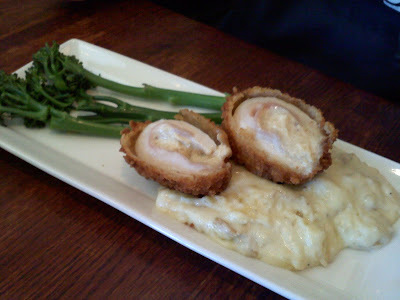 My mom chose the salad with blue cheese dressing: Mom's entree was Chicken Cordon Blue with mashed potatoes and broccolini: She said it was good and just the right size. She's not a fan of broccolini so she just ate the top floret part. 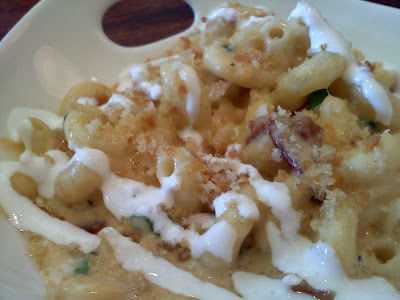 I ordered the macaroni and cheese with bacon and sour cream: I think I've had this before. It's pretty good. It was definitely filling and my tummy had been filling quite empty. Anyways, the main point of this post was to share the fried cheese balls in soup dish. What a great idea! And that I find it much more refreshing to have a sit down meal in a mall restaurant as opposed to a quickie meal from a food court with lots of people wandering around. It's a chance to rest and get away from the mall hustle and bustle. I'm declaring fried cheese balls the greatest things to happen to tomato soup since ever. Genius!